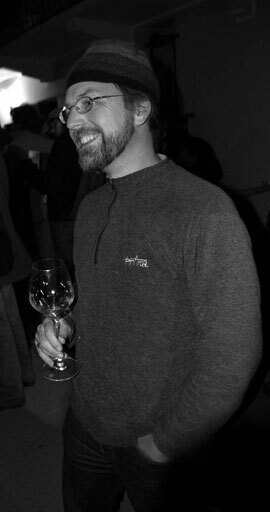 Photo taken February 2007 by Ivan Brehm at the Cantè j'euv celebration in the Roero, Piemonte (Italy). It took damn near 40 years for me to find my passion: wine. For those, like me, who are as curious about the path as the place to which it leads, here's a summary. I studied the liberal arts at St. John's College in Annapolis, MD and Santa Fe, NM and there found an educational home for the first time - a place where a small community of learners takes seriously the asking and exploring of important human questions through conversation. I remain involved with St. John's College through its alumni community, especially the Northern California alumni chapter. I taught St. John's-style literature and philosophy seminars at St. Mary's College of California, but the wine world has consumed all my time in recent years. After St. John's, I earned a Master's degree in structural engineering at the University of California, Berkeley. Thus began my masquerade as a techno-geek. The structural engineering luster wore off quickly, but my tour of duty at U.C. Berkeley during the late 1980s did introduce me to microcomputers, while my brief sojourn as engineer introduced me to the world of Computer Aided Drafting (CAD). From the late 1980s through early 2000s, I was a self-employed CAD consultant through my company, Daedalus Consulting. My work in that guise included consulting to engineering and software companies, developing custom software applications, teaching computer classes, and writing computer magazine articles and books. I began working in the wine industry in 2001. I had become convinced of the truth of the well-worn dictum, "in vino veritas" but wasn't sure how to develop the corollary, "in vino pecunia". I was fortunate indeed to be hired by Paul Marcus Wines in Oakland, California, where I eventually became the buyer, manager, and author of most of the store's comunications (newsletter, Web site, Facebook page, and Twitter account). In August 2010, I began working part-time as a wholesale wine representative in the Bay Area for José Pastor Selections (a.k.a. Vinos & Gourmet), an Iberian portfolio whose focus is grower-produced wines from unusual and classic regions of Spain and Portugal, including the Canary Islands, Galicia, Asturias, Catalunya, and the Levant. In January 2011, I came on full-time with José Pastor and became the National Sales Manager, or as I prefer to think of my job title, Evangelista. I work with our distributors around the U.S., develop print and web materials about the company's producers and their wines, and go to Spain with José on buying and prospecting trips. When I'm not buying, selling, writing about, or drinking wines, I occasionally provide computer support and web site development for wine importers and distributors. I also write wine and food articles for various publications, including Edible East Bay magazine, and draw wine maps whose amateurishness some people find charming. CruForge is my business for pursuing this miscellany of work that attempts to marry wine, computers, and writing. My other passions are music and languages, both modern and ancient. Team Rioja provides much of my inspiration for pursuing those callings. If you need to get in touch with me, here's how.